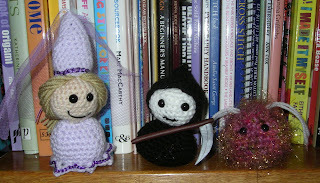 A Princess for Nan (went a bit overboard with the embroidery there), a Grim Reaper for Dad, and another alien for K. One more alien to complete the family and then I'm completely out of requests...it feels a bit strange, because I don't have a big ongoing project happening at the moment either, and nothing really on a time limit. I'm seriously thinking of starting Beth's Little Star Afghan for K - she really liked the pattern, it looks fun and quick, and I cocked up a bit back and bought a relatively enormous amount of 4-ply when I meant to buy DK yarn. It would be green stripes, but I think it might look quite nice. K is very into "just having a little rest" at the moment so perhaps this would be an appropriate project to start. I really want to make her a dress - I have great fabric for it, but need 4-ply cotton to crochet the tunic top and I can't afford new yarn right now. I'm saving every penny I have towards the yarn to make a ballet cardigan for her. She's growing rapidly at the moment so everything has to be done a size bigger just in case. I love these photos! Must show Alex the Cthulhu when I get hoem.